Another year has almost passed and Christmas is just around the corner. With this post I want to wish you all happy holidays! Please enjoy your time together with family and friends. Before we all get into Christmas mood, I have a picture for you that shows what we say before Christmas in Germany. Frohes Fest! The same to you and your family Dennis I hope you enjoy yourselves however you spend the day. I know that in Germany Christmas Eve is the time when you open gifts etc. The heart shape, is it gingerbread? I remember seeing these sold at specialtyshops when I lived in Adelaide. There is a strong German tradition in South Australia, many Germans, Lutherans mostly I think, came to settle in the Barossa Valley north of Adelaide and in the Adelaide Hills where there are still towns with German names. They started many of the wineries that South Australia is well known for. The gingerbread is very nice but I don’t think I could eat a lot of it now. It was at fairs in Adelaide and also Hahndorf, one of the towns I mentioned that I first saw these years ago. During World War One many of the little towns were forced to change their names to something more English sounding. Later some changed back but others didn’t. Interesting. I believe I heard similar things from US citizens. There seem to be towns of German immigrants as well that had to change names during the war period. I think it happened in a lot of places. Sad because most of the people had probably been there for a couple of generations and probably considered themselves citizens of their new country. True, that’s sad. I’ve seen a documentary where French people after the war cut the hairs of French females that were known for having a relation with a German soldier during the German occupation. If I remember right, these French womans also got stoning sentence in the public on the streets. While our German ancestors are responsible for the most cruetly at that time, or more their leaders, it’s somehow easy to forget that bad things happened on all sides. War is insanity and shows the abysses of the humans. I have read of that too. They were considered to be collaborators. I wouldn’t judge them so harshly, they had their reasons no doubt. No side is completely guilt free in war and yes it is insanity. I am glad that these wars are not a thing anymore in our parts of the world, but there are still old and new lunatic nutheads in very high positions leading strong nations and that is somehow worrying as well. When I read the news, I sometimes get the impression that there is already a cold war going on between certain nations again. Not to forget the new terror in our cities, and of course the far away wars. I think we are not even close to world peace, and I think humans will never learn. Frohes Fest to you, too, Dennis! I loved being in Germany during the Christmas-New Year season! You know how to celebrate the season with grand style! Of course, I like marzipan, and that was a great time of year to find it available in the Christmas markets. I’ve enjoyed your posts in the past year, and look forward to many more in 2018! 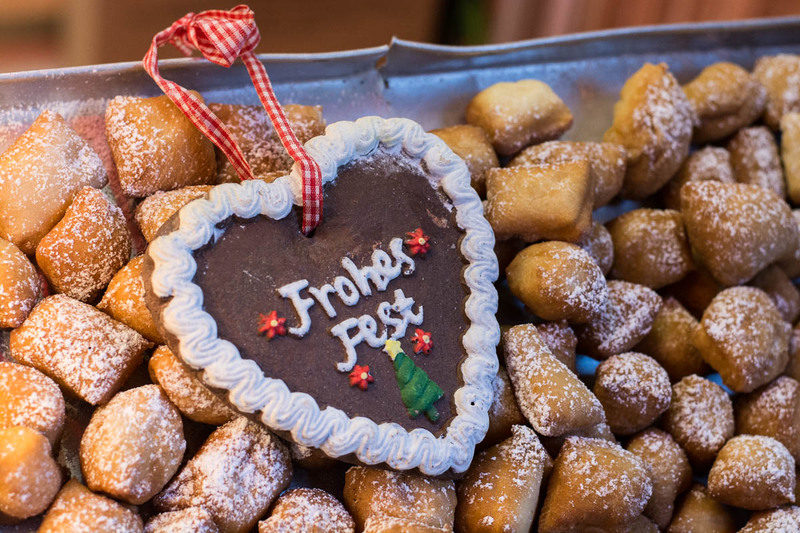 Frohes Fest! If you like Marzipan, you would love our city Lübeck because Niederegger Marzinpan comes from here. 🙂 People whisper that Lübeck is the capital of Marzipan 🙂 I can see why you liked it in Germany during Christmas, because our cities are indeed very beautiful during that time. Happy holidays! That is true, our city is rich of history. Ironically, I could reassure you that you would not eat that much Marzipan if you lived near the source. 🙂 I like Marzipan, but I don’t eat it often because it’s way to common here and sold in every store. It’s basically the same like friends from South Germany were surprised that most of us here don’t like to eat fish even if the source, the Baltic Sea is that close 😀 I think the closer you are to something, the less you like it because you ate it too often. Both examples, fish or Marzipan are probably more exported than consumed in our area 😀 But of course it’s something that people are proud of, because it’s part of our cities economy, as the company Dräger that supplies many firefighters, hospitals and so on in the world! 🙂 So, yeah there is definitely a bit of local pride because citizens know what our city is known for, like history or what we produce. Talking about history again, we have for sure still some historical places and buildings. But there is also a sad trend that modern city architects “place” modern buildings in our historic district. It absolutely doesn’t fit in and destroys parts of the city culture or view. Of course they are not allowed to damage or remove cultural heritage, which is great, but when a normal building is demolished they build modern architecture there. This is how the overall picture sadly changes. I am following a group of our city in Facebook where users post old newspaper clippings, old drawings, old postcards or any old pictures of the city they found in the basements, in the attic or from inheritance. Parts of our city are still beautiful, but in this group I realized that our city was once much more beautiful. The city had a consistent style. Especially around 1800 when the ramparts were not removed. Parts of the ramparts and city fortifications are still visible, but only to those that know it. An example would be a small forest park on something that a tourist could call a hill. But this was a rampart. Fortunately our city tries to teach visitors these things, which means you find a lot of signs that explain it. The Trave River was also part of a massive fortification. As you said, the Hanseatic League, there are a lot of things and facts to discover about our city. It’s absolutely clear that a city wouldn’t need medieval style fortification when artillery and better range weapons were invented. And of course I am glad we don’t have wars anymore. But since the ramparts are part of the history, I wish they wouldn’t have demolished most of it, or I wish they would have maintained the few remainings. I was interested why so much things changed, but it started to make sense when I have read that some things had economic reasons (Removing ramparts to be able to extent the Trave for better Baltic trade), or that other things changed after wars and structural damage. I think we citizens and the tourists of course can be glad that at least some historic attractions have been rebuild after wars, or that some stayed intact. I think we still have to offer a lot to see, it just gets apparent that the city has changed when you see an old postcard or a drawing. 🙂 Also, I think with a few exceptions here and there, the city definitely still has the Hanseatic urban image preserved, especially in the historic district. Also I learned from other bloggers around the world and their places, that it’s the same in their cases. That parts of their city history is preserved, while other things changed a lot over time. I sometimes wish I could set up a portal to instantly port other bloggers to my place, to show them some cool things. Sometimes when I see tourists, I hope they have a good city guide who doesn’t only show or explain the obvious buildings like the Holsten Gate (which is of course important too). But there are also many less apparent things, or some things that are quite hidden, so hidden that some locals don’t even know about it. That’s maybe where photography is handy, you learn a lot about your own place. Historic preservation all to often comes down to money. I agree with you that we should try to do this in the interest of better appreciating our past. Where I live, we had a city park, for example, that had swans on a pond, beautiful flower beds, a colonnade that overlooked a sunken garden, a fountain, a Spanish-style (architecture) bath house by a swimming pool, a small zoo, tennis courts that were flooded each winter to make an ice skating rink, and a band shell where a city band played concerts for the people every summer. Many of those features are gone now, and people remember them and miss them. The bath house was converted into a military museum, the fountain was restored and made even more symbolic of the city with computerized colored lights and water outlets into something better than the original, there is a campaign to collect money to replace the colonnade with a new one, and the swimming pool was moved to a new location where it could be increased in size and utility. (A arboreum replaced the old swimming pool.) In addition, the original city museum was in a sod house that was lost in a flood. A local banker left money in his will to build a more solid and permanent museum, which was done in the latter part of the 20th century. Another couple, ranchers, left a multi-million dollar sum to the city when they retired from ranching and sold the property. It was used to make a beautiful building that is the gem of the park system and fits in well with the setting. So, a combination of old and new makes for a better but different park. Too often, though, as you note, the old is torn down and replaced with something new that doesn’t match or complement existing structures. Particularly in your country, there are beautiful historic buildings from centuries ago that attract visitors and are the pride of the cities where they are found. It is important for people to evaluate how new structures fit in or you get jarring clashes of styles instead of something that shows thought was given to enhance existing neighborhoods with new structures that are updated homages to the historic structures! Yes, it’s not really the problem that something new is added but as you said that they don’t try to match it with the excisting old architectural style. We got for example a new four-storied shopping center with a very modern glassy (almost reflecting) external wall, and the architecture looks good, but it doesn’t match with the red brick gothic architectural style that is still visible in our historic district. That does indeed clash with the old style. At the town square they did something very similar. Especially the town square shows remainings of old times, but they decided to add structures there too that don’t match. They even painted a large gothic style building front/wall white at the town square, even if it was dark stones for hundreds of years. The surrounding buildings still are, except that one part of it is now painted white. Hilarious 😀 Absolutely out of place. Have a wonderful holiday and a fantastic new year!